Whenever Marshmallow is in town for the Summer (she lives in Taiwan), we meet up for eats. Hey, she should come back more often! Having already dined on Neapolitan-style pizza at Cotto, we planned to do lunch on another day. Elaine and Costanza were going to join us as well. 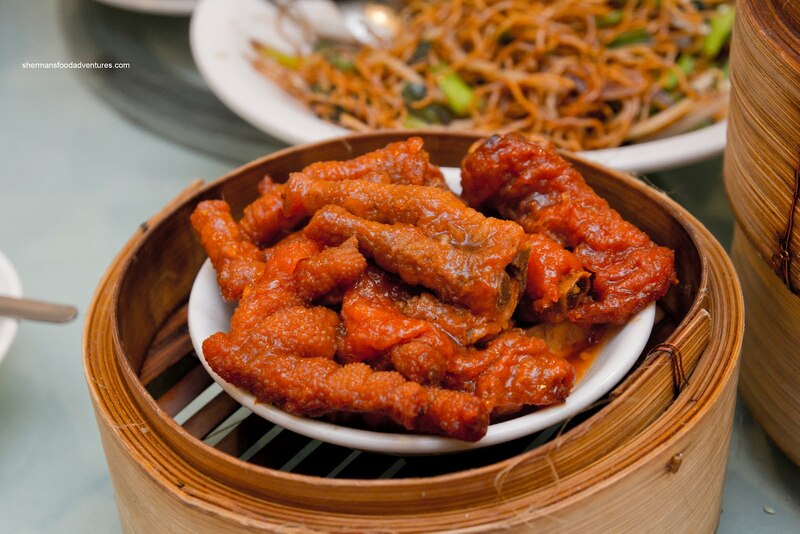 Seeing how they were going to be around the Oakridge area during that time, we decided to do Dim Sum on the Westside. Now that is not as simple as it sounds. 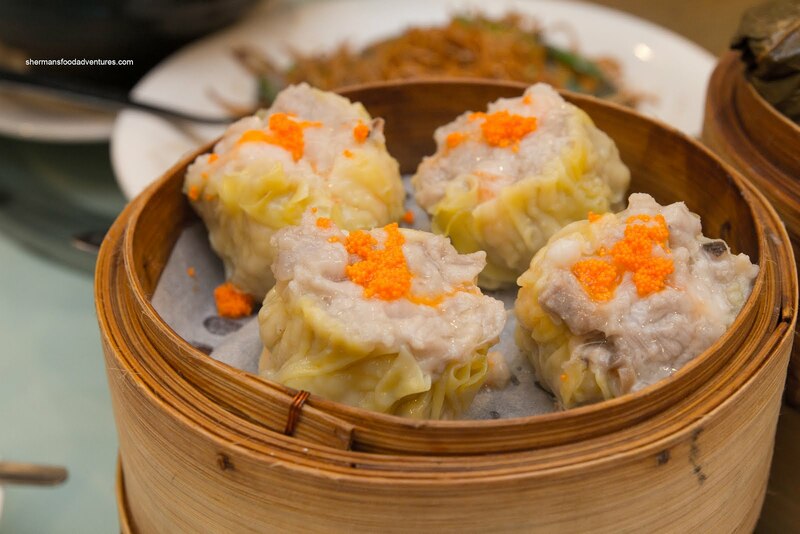 Most of the best Dim Sum joints in Vancouver are on the Eastside. When I mean best, I mean good food and good value as well. 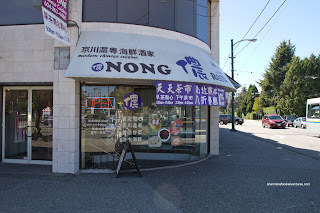 So throwing good value out the door, we made a reservation at Nong Chinese Restaurant on the corner of 41st and Granville. Formerly The One Chinese Restaurant, it is located below street level. 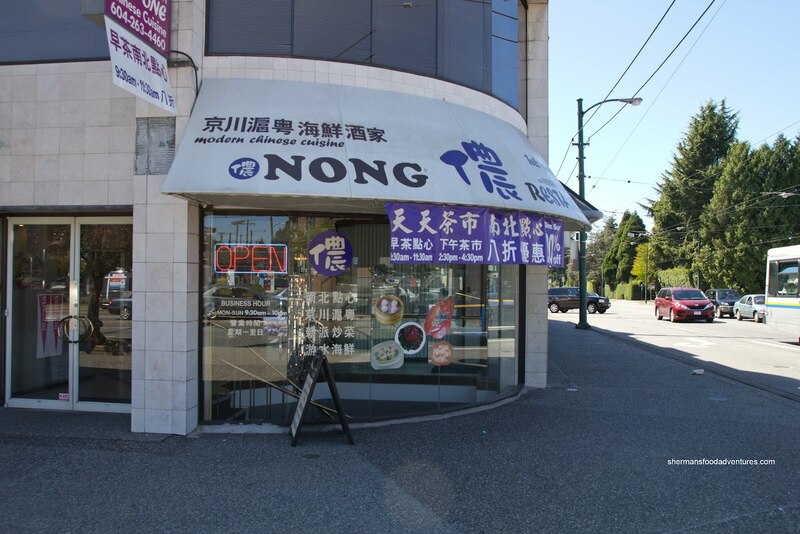 When we used to live in Oakridge, we'd frequent this restaurant (different name back then) every weekend. Now that we're nowhere nearby, this was the first time we'd been back to this location in nearly 10 years. With our reservation, we were seated in a private room which suited us just fine as we had 5 kiddies with us. They could make as much noise as they wanted and they pretty much did... So they left me in charge of ordering food, which is the equivalent of taking all the traffic lights off of #3 Road, because I pulled a Mijune. There was way too much food on the table, to the point where we had to resort to stacking steamers 3 high to fit onto the lazy Susan. 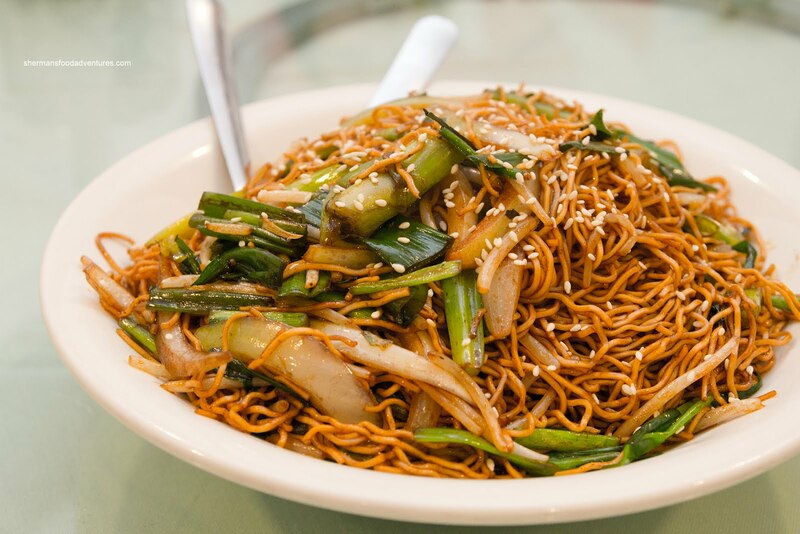 The first dish to arrive was the Soy-Fried Noodles. These were predictably greasy. The noodles were still chewy with adequate amount of flavour. I personally am not a huge fan of adding greens or onions to the noodles, but it did add flavour in this case. 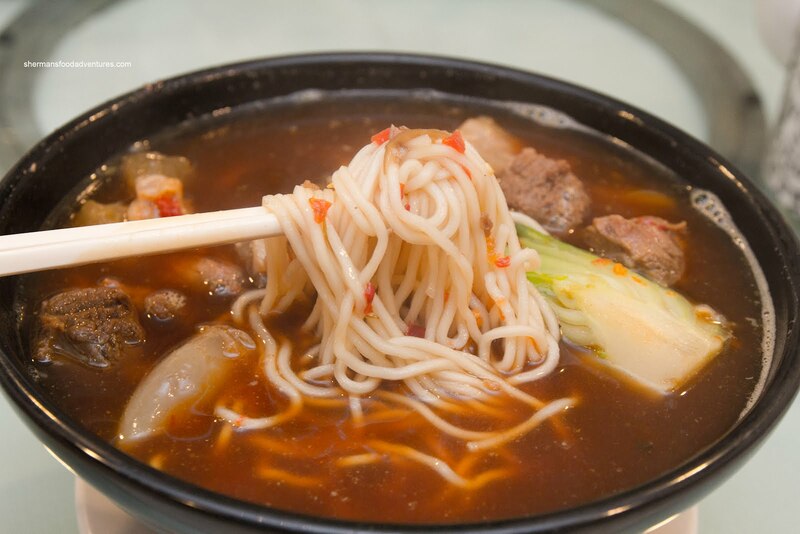 For the adults, we got a bowl of Szechuan Beef Noodles. The noodles were both plentiful and al dente. They sat in a spicy broth which curiously had no depth - lots of flavour, but it was pretty superficial. The chunks of beef were moist while most of the tendons were soft (except for a few tougher ones). As evidenced by the beef noodle, there were many Szechuan options on the menu. 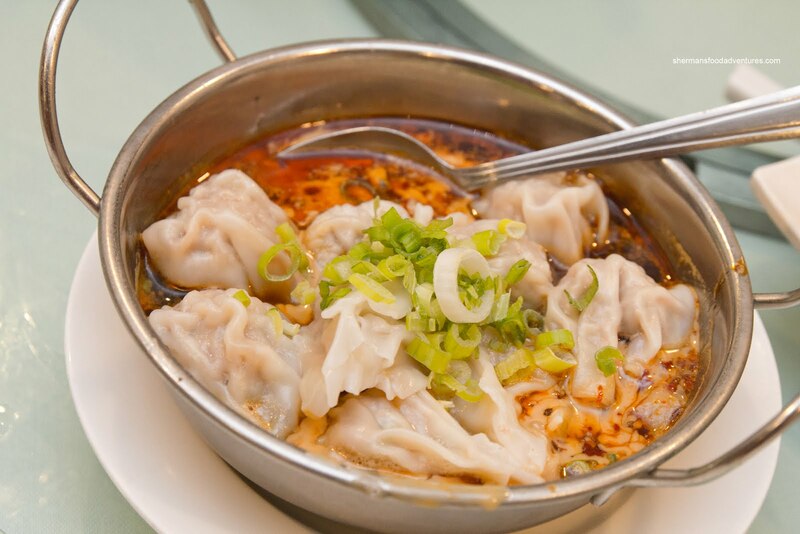 Hence, it was no surprise to find Spicy Wontons were available. This was a healthy portion of meaty wontons which were on the softer side. Although there was a considerable amount of "red" colour and chili oil, the whole dish wasn't only mildly spicy. It was probably due to the overabundance of peanut sauce. Personally, I could done without it. 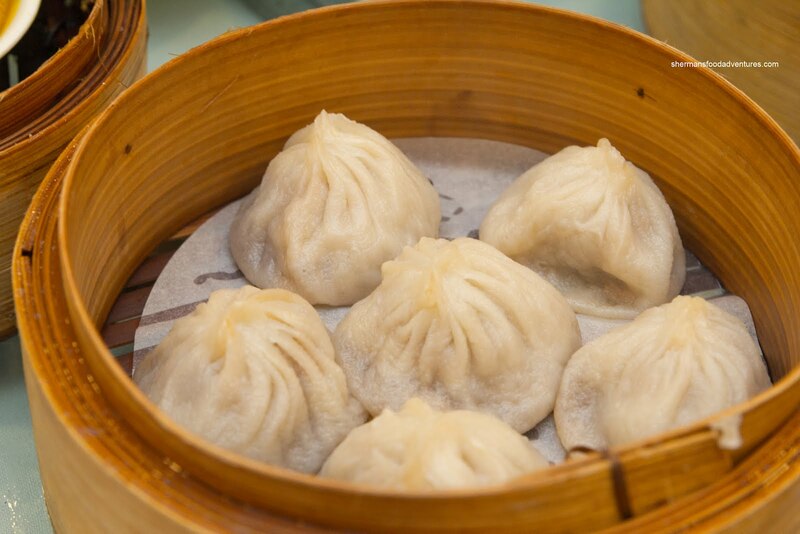 Moving onto another region of Chinese cuisine, we had the Xiao Long Bao (Shanghainese). We actually got 3 steamers of these (6 dumplings each) because we wanted each person to have at least 2 and the fact Costanza's son could down one order himself. Well, everything was conspiring to make this decision a mistake. First, Costanza's son decided to have and "off" day and only ate one dumpling. Furthermore, everyone else had one as well. That left nearly 2 full steamers of XLBs. It was too bad really because they were actually decent for this type of restaurant. I am not going as far as saying they could compete with the best in town, but you get the idea. As expected, the dumpling skin was slightly thick with a gritty meat filling. There was a good amount of soup inside though which was pretty bland except for a bit of sweetness and a pretty strong hit of Shaoxing wine. 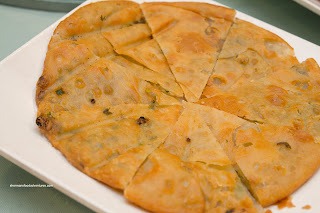 Now as for another Shanghainese offering, the Green Onion Pancake, it was the deep fried variety. Although I do like the crispiness of the deep fried version, it can often be an greasy mess. This one was somewhere in the middle - it was neither greasy nor was it not-greasy. It was crispy but a touch salty. 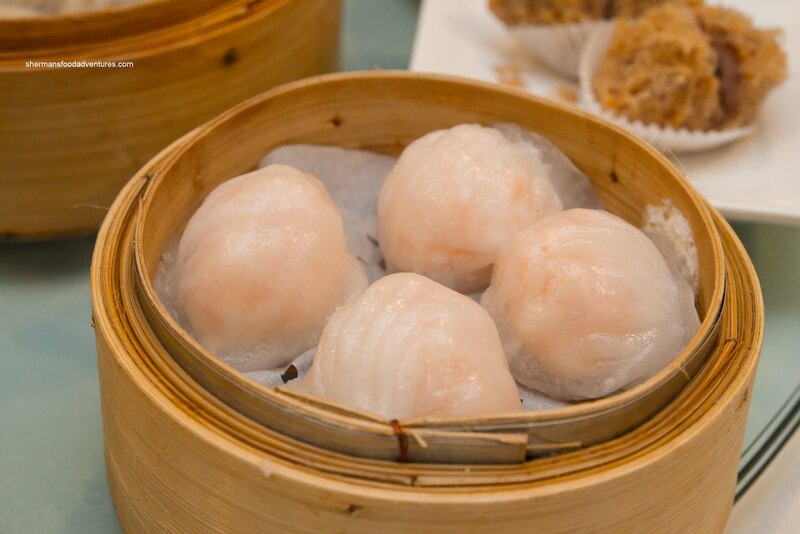 Continuing on with our tour of the different types of Chinese Dim Sum, we found ourselves back with the good ol' Cantonese standard - Haw Gow (steamed shrimp dumpling). The dumpling skin was thick and chewy (despite the good visuals) while the filling was full of large pieces of whole shrimp. The shrimp were crunchy and had a good snap. However, there was a complete lack of seasoning, hence we needed a side of hot sauce to alleviate that problem. As for the Sui Mai (steamed pork and shrimp dumpling), they were pretty substantial in size. There was plenty of crunchy shrimp mixed in with chunks of pork with a nice bounce texture (there was a good amount of fat too, which was good and bad). Unfortunately, there was a complete lack of flavour once again. For some people, I suppose that would be a good thing since it implies less MSG was used. Yet, for me, it really didn't have much impact. Again, the hot sauce saved the day (which was not really a bad thing either I suppose). Onto some carbs, we had 2 orders of the Loh Mei Gai. That meant we had a whole order leftover... Hey, they told me to do the ordering! They were just not prepared to eat, that's all! Amateurs! Anyways, the sticky rice had a balanced texture where it was glutinous and moist while not mushy either. 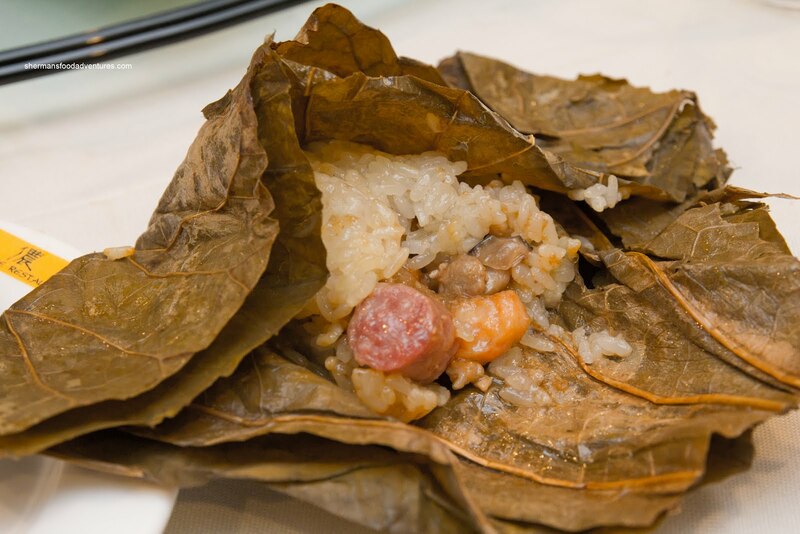 There was more filling than rice with tender ground pork, shrimp, shiitake mushrooms and the requisite piece of Chinese sausage. Even with the plethora of ingredients, the whole thing was... you guessed it, bland. When the Chicken Rice arrived, there was a collective moan since no one was really interested in a big serving of carbs after the sticky rice. That was too bad since it was pretty good. The rice was nicely done where it was chewy yet not dry. There was ample boneless dark meat on top which was tender while only being somewhat moist. Again, the the chicken was suffering from a lack of seasoning. It would've been nice to get a hit of ginger somewhere. Luckily, this was not a huge problem because the whole thing was doused with sweet soy anyways. To go with the rice, I thought it would be nice to have some Pork Spareribs as well. As you can see, there was not a whole lot of black bean or anything else as a seasoning agent. The result? It tasted like salt. But wait, that was actually a good thing as this dish was adequately seasoned. Furthermore, the portion size was really good since the spareribs were spilling off of the plate. There was a decent mix of meaty pieces and cartilage where the texture was slightly chewy while still being tender. 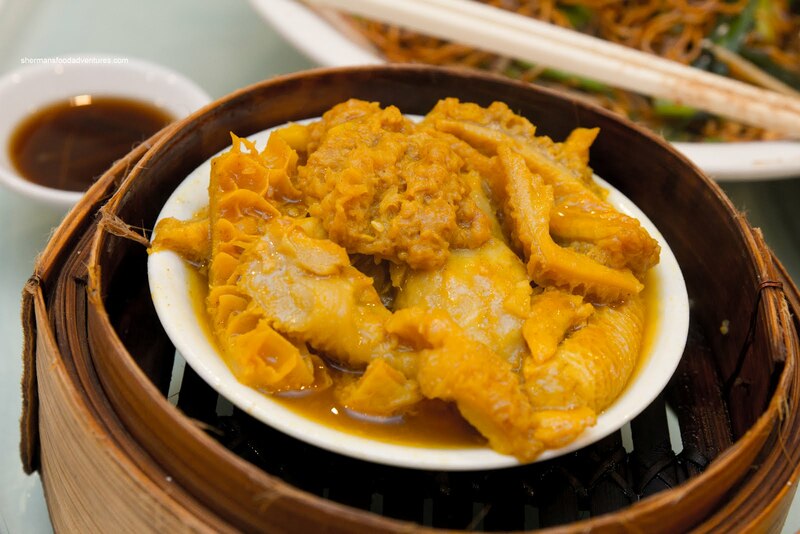 Onto the offal side of Dim Sum with the Curry Tripe. Yet another properly seasoned dish, there was a decent hit of curry, ginger and garlic with touch of sweetness. But once again, there was a deficiency - the tripe was too soft. It was practically melt-in-my mouth soft. I'm sure some people would like that. 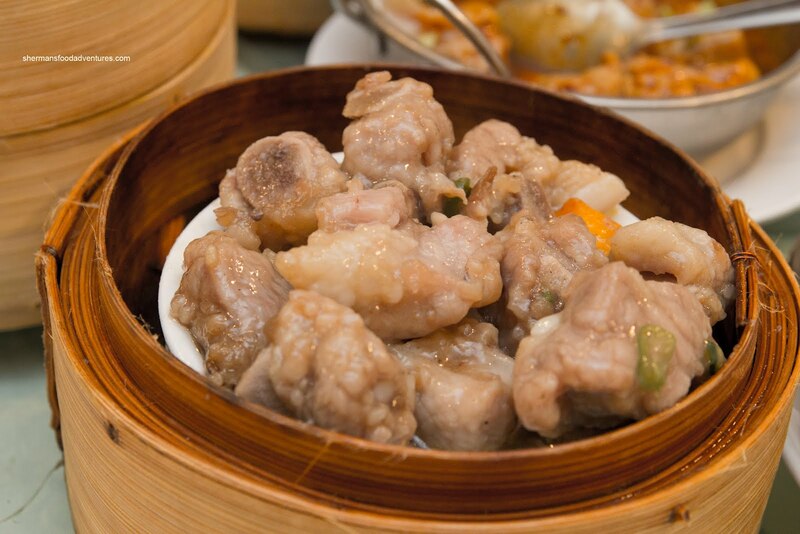 For me, I like a touch of chew left in the tripe. From tripe to Chicken Feet, this was probably one of the better dishes of the meal. The chicken feet were plump and fried to a nice golden reddish brown. The skin was still moist while exhibiting a chewiness. The cartilage underneath was soft and was easy to detach from the bone. Flavourwise, there was a good balance of salty and sweet with a hit of garlic. 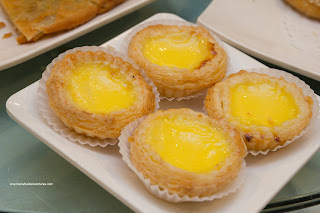 Onto dessert, we had the obligatory Egg Tarts. Much like all of the other dishes, we got 2 orders which subsequently did not get touched. The kiddies were doing a "reverse day" of sorts and did not want them. Again, their loss because they were not bad. The flaky tart shell was baked nicely with a golden brown exterior. The egg custard filling was only semi-sweet and had a nice consistency where it wasn't too soft nor too stiff. 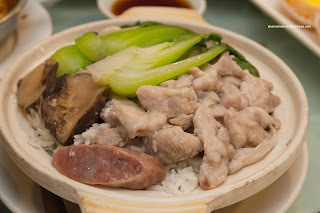 At the end of the meal, it was pretty obvious to us that they were trying to be the Jack-of-all-Trades (a combination of Szechuan, Shanghainese and Cantonese Dim Sum). Therefore, everything was definitely passable, yet nothing was particularly memorable either.